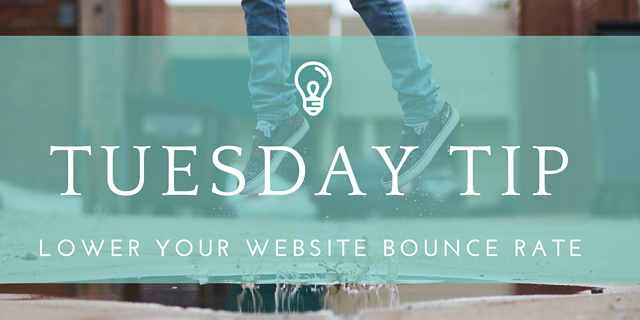 Tuesday Tip: Decrease your site's bounce rate with the following ideas. I don't know about you, but I take high bounce rates personally. After all the effort – content strategy, SEO, social media, not to mention our expensive site design – users are exiting right when they land on the page? Really?! We all want them to land on our pages, stay there for a bit and then travel to more of our amazing content. If done right, they may even convert to customers or share content with others. With today's tip, let's lower the likelihood users will bounce. Jasmeen Gagnon of Digital Doughnut gave us "7 Secrets for Decreasing Your Website's Bounce Rate." Let's look at some of my favorites and add a few ideas to the list. First, a few of the more quick fixes to lower your bounce rate. 1. Check page load time. Think about the sighs you get at a coffee shop when you order a fancy latte we all know will take way longer than the drip cup we're ordering. Or the glares you get when you go in the 10 or fewer line at checkout, with 11 items. People don't like waiting. Same goes for your site. Slow load time, people bounce. Here's a fun infographic from Neil Patel at Quicksprout to help you understand how load time affects SEO. This post from V Digital Services offers insight on two tools they recommend for testing your page load time: Google PageSpeed Insights and WebPageTest. 2. Lower your page load time. High bounce rates could also be, in part, due to incorrect information in your Google Analytics. As Digital Doughnut explains, referral spam creates "fake traffic" to your site. This not only reflects as a high bounce rate in Analytics, but can also "negatively affect the performance of your website." They recommend you add a code in your .htaccess file. It's likely you'll need to consult your developer for this one, but it's a fairly fast solution. Now, some more long-term methods of lowering your bounce rate. 1. Perform a website audit. Or have an agency do one for you. An audit uses tools such as Crazy Egg which can help you find how users are navigating your site. This will help you identify the strong and the weak areas of your site or rather, where people stay and where they bounce off. By knowing these aspects, you'll be better able to optimize your site. If your bounce rate is super high and/or your site is a few years old, it's probably a good idea to question your site's design. Although it can be expensive, a well-executed redesign will help you set up your site's architecture in a way that better fits your users' needs. If this is you, here are a few questions to ask to help you commit to that big decision. If your content isn't good, people won't stay on your site – no matter how beautiful or well-optimized it is. Maybe you think your site content is great, but if your users aren't digging it, what's the point? Take some time to thoroughly flush out your audience personas (start with this infographic) and then write content that fits their needs, or even walks them through the buyer's cycle. Let our team know if you need any help with this stuff. We recognize it can take a lot of time and we want to help you do so efficiently.